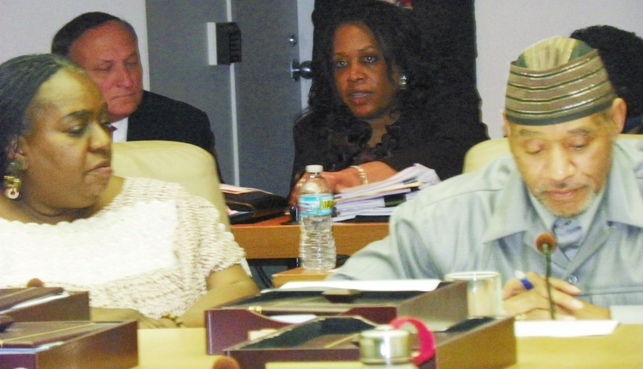 Consent agreement opponents Council members JoAnn Watson and Kwame Kenyatta listens as Krystal Crittendon (center) advises Council prior to vote on PA4 consent agreement. Detroiters to attend Council session Tues. June 5, 10 am in support; Council also expected to vote re: de-certification of Human Services Dept. DETROIT – City of Detroit Corporation Counsel Krystal Crittendon filed suit in the Michigan Court of Claims June 1 demanding that the state make good on its debts to the city before enforcing the “Fiscal Stability Agreement” reached between Mayor Dave Bing, the City Council, and the state of Michigan April 4. Ingham County 30th Circuit Court, where state Court of Claims is housed. The Michigan Court of Claims is part of Ingham County Circuit Court. It has exclusive jurisdiction over cases involving claims of over $1,000 in money damages against the state. 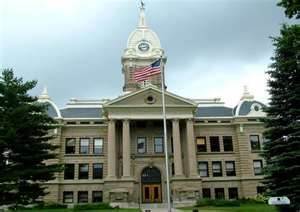 It is part of Ingham County Circuit Court, whose judges also carry out its duties. 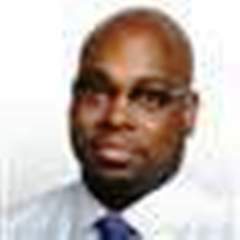 Ia a May 1 legal opinion requested by the Detroit City Council through Council member JoAnn Watson, Crittendon said it is illegal under state and city law for Detroit to contract with any entity which has defaulted on its debt(s) to the city. She attached documentation for each debt, including $224 million resulting from the 1998 agreement executed by then Mayor Dennis Archer and then Governor John Engler. She also attached and refuted an opinion from former Corporation Counsel John Johnson, Jr. that that debt was not enforceable. 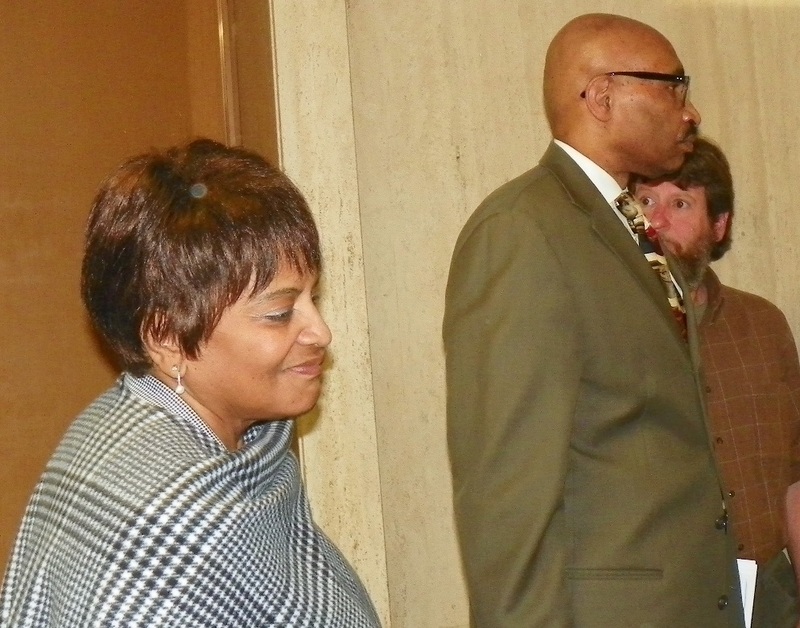 Johnson was found guilty of one count of “professional misconduct” in 2010 by the state’s attorney grievance board in 2010, involving the infamous Kwame Kilpatrick text message scandal. The board said he told the Detroit Free Press that no settlement agreement existed in a lawsuit against then Mayor Kwame Kilpatrick when in fact it did. Crittendon said in an April 1 opinion attached to the May 1 document that the Fiscal Stability Agreement constitutes a consent agreement under Public Act 4, noting numerous sections of the agreement which cite language from PA 4. She said PA 4 does not void city and state laws barring contracts with parties in default. 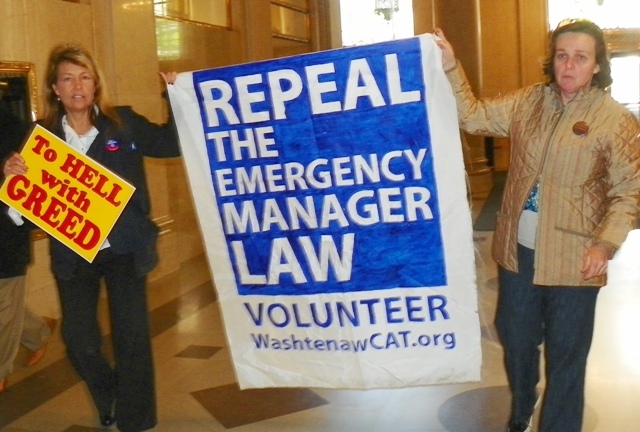 Some of dozens of protesters who packed Detroit's state building May 17 to demand that appeals court put referendum to repeal PA4 on the ballot. 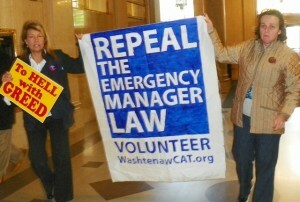 “The Emergency Manager Act does not mention or refer to MCL 117.5(l)(f) [state default law], or provide that the Home Rule City Act prohibition against a city contracting with one in default to the city does not apply to a consent agreement entered into under the Emergency Manager Act,” Crittendon wrote. The distinction is key because a state appeals court has not yet ruled on whether a referendum to repeal PA 4 can go on the state’s November ballot. Crittendon informed State Treasurer Andy Dillon of her position that the agreement is “void” in a letter May 11. Dillon disputed the validity of the debts she cited, but not the validity of laws barring contracts with entities in default. The Court of Claims would rule on the monetary dispute. Mayor Dave Bing concurred in published remarks. Gov. 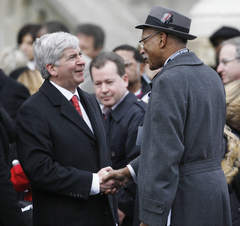 Rick Snyder and Mayor Dave Bing concur on proceeding with consent agreement. 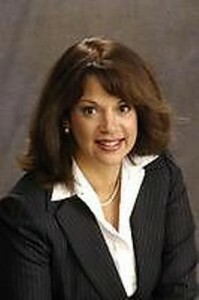 But Sharon McPhail, former General Counsel for the City of Detroit, who supervised the office of the Corporation Counsel, disagreed. Under the revised Charter, the Corporation Counsel represents both branches of city government, and has the duty to enforce the Charter, including taking judicial action. The Corporation Counsel can be removed only for cause, with a supermajority vote from the City Council. Several Council members who voted for the Consent Agreement have said they support Crittendon’s pursuit of a legal judgment. They have held off a vote on appointing two members to the nine-member Financial Advisory Board the agreement provides for. McPhail said Crittendon, who has practiced law since 1973 and was appointed Corporation Counsel by then Mayor Kenneth Cockrel, Jr. during his short term in 2009, is an extremely competent attorney. McPhail said she also believes the consent agreement is illegal. Valerie Glenn, a co-founder of “Free Detroit,” a coalition of Detroiters opposed to the consent agreement, said they will present a letter to Corporation Counsel Crittendon commending her action, and copies to the City Council, during its formal session Tues. June 5 at 10 a.m.
Valerie Glenn (2nd from left) with other members of Free Detroit, including Sandra Hines at right, declare "NO CONSENT" outside May 17 Court of Appeals hearing on PA4 referendum. The letter also challenges the budget recently passed by City Council and signed by Bing, which includes a whopping $171 million in cuts, the elimination of many city departments, and the lay-offs of 2566 city workers. “Mayor Dave Bing and said Council Members have further violated the law by approving a 2013 City budget which was based on an illegally authorized financial stability agreement; thusly, the 2013 budget was passed without the necessary authority,” the group says. Glenn and four others have filed ethics complaints against the City Council “Fatal Five” who voted for the consent agreement, Bing, and Deputy Mayor Kirk Lewis, charging them with violations of the City Charter. Glenn said the group is also planning to file ethics complaints against Governor Snyder and State Treasurer Andy Dillon. Meanwhile, the corporate media has reacted to Crittendon’s action with outrage. Absolutely nothing in the consent agreement provides solutions for those matters. There is no state funding attached to the agreement, nor does it ask for an infusion of cash from the federal government, which U.S. State Representatives John Conyers, Jr. and Hansen Clarke have advocated in legislation introduced in Congress. The consent agreement also neglects to focus on the chief financial problem facing the city, other than to blame city officials for borrowing money. 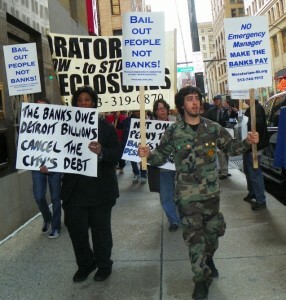 Marchers demand "Cancel the debt" May 9, 2012 in downtown Detroit. Hundreds demanded a moratorium on Detroit’s monstrous debt to the banks May 9, during a protest outside the Bank of America offices on Griswold, which marched to the Coleman A. Young Center. Detroit owes a total of $12.6 billion to the banks, much of which the banks and Wall Street foisted on the city, as they did in 2005 when city officials approved a $1.5 billion pension obligation certificate loan after represenatives from Standard and Poor’s and Fitch Ratings came to the table. 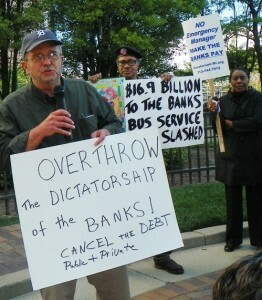 Attorney Bob Day noted that the struggle against the banks is world-wide. Click on Crittendon May 1 letter to read Corporation Counsel’s advice to City Council. Click on , State water bill to city, Property claims dispute with state, CA John Johnson letter re revenue sharing debt, and AG opinion on default for attachments to Crittendon’s May 1 opinion. Click on Letter to K Crittendon From Free Detroit NC to read Free Detroit’s letter supporting Krystal Crittendon, signed by former Charter Commissioner and attorney Rosemary Robinson and other activists. 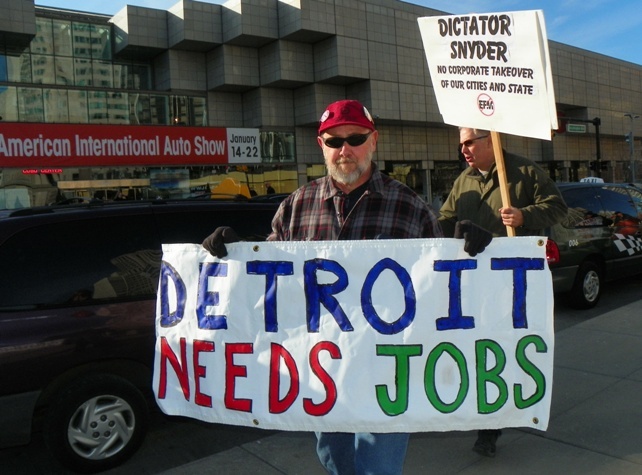 Click on Free Detroit sample attachment for ethics complaint for sample ethics complaint. 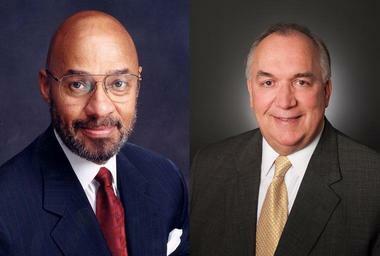 Free Detroit is encouraging all to file similar complaints with city Ethics Board. 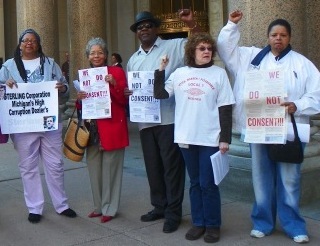 See http://voiceofdetroit.net/2012/05/28/detroiters-begin-ethics-complaint-campaign-against-bing-councils-fatal-five-lewis-and-brown-over-consent-agreement/. “Free Detroit” blogspot is at http://www.freedetroit.org/. Contact information: Phone 313-444-0061 Email info@freedetroit.org.